For Piglet’s first birthday she received a Fisher-Price Dance & Move Beat Belle. Something that has been pulled out of the toybox each and every day since. The combination of lights, music and the ability to dance along with Beat Belle really appeals to her carefree nature. Whilst she loves to interactive with Beat Belle, it does have a drawback that it is a quite a large toy so not very portable especially when we are visiting family and friends and she wants to hold it in the car seat. Fisher-Price understands that little ones what to take their favourite toys with them so have introduced the BeatBo Juniors. For a little guy, BeatBo has some big moves! This dancing buddy wiggles, sings & lights up to the beat with baby for on-the-go fun – because it’s always time for a dance party! 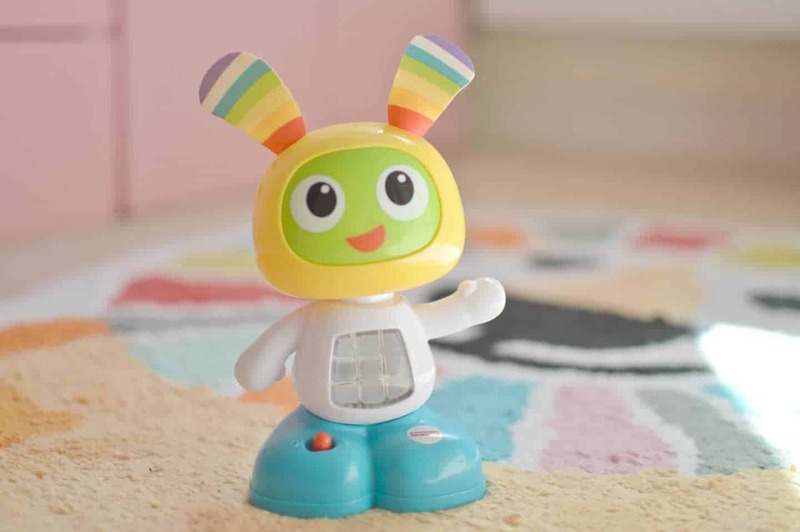 The BeatBo Juniors is around a third of the size of the original BeatBo and Beat Belle toys. Instantly making them easier for little hands to pick up and carry around with them. Piglet especially is loving that she can have BeatBo alongside her at the dinner table for extra entertainment or can be taken in the car with us on trips out. With a simple on/off switch on BeatBo’s foot the music, sounds, and lights are activated by moving BeatBo’s head. So much fun watching his little head wobbling and wiggling to the beat. Fisher-Price Bright Beats Juniors // Where can I buy? The Fisher-Price Bright Beats Juniors is priced at £12.99 and is available to buy from Tesco, Amazon, and all other good toy retailers. Lights, music, and dancing are three of Piglet’s favourite things. 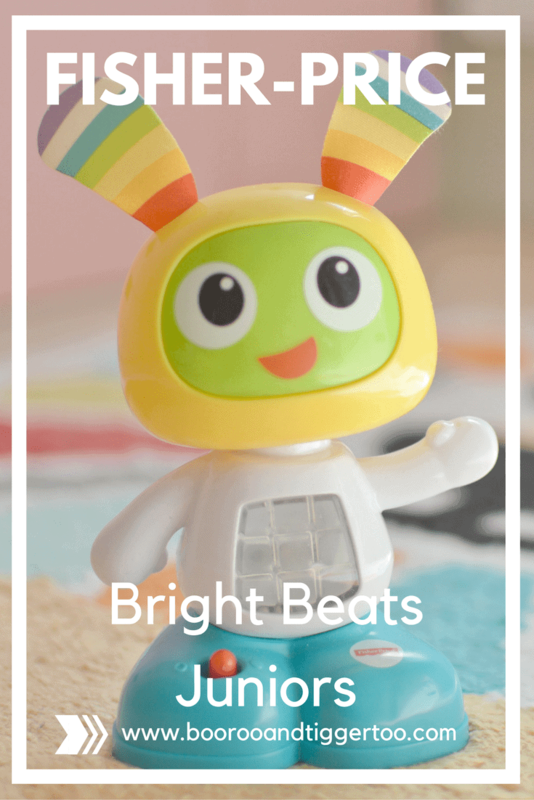 So the Fisher-Price Bright Beats Juniors is made for her – with the ability to pick BeatBo up and take him along on her adventures around the house and on our travels too. 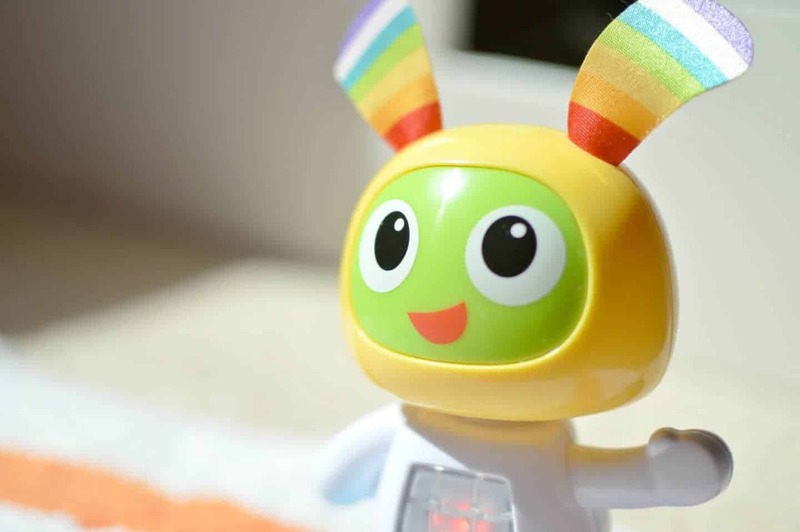 Although there aren’t as many buttons and interactive features on the smaller version it is still great fun for little hands and the look on their face when they bash BeatBo to make the music and lights start is so cute.